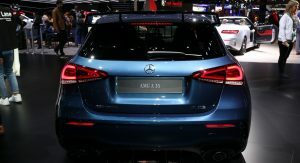 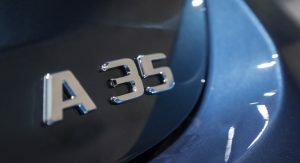 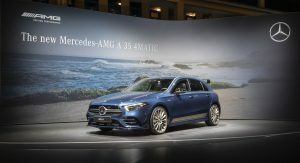 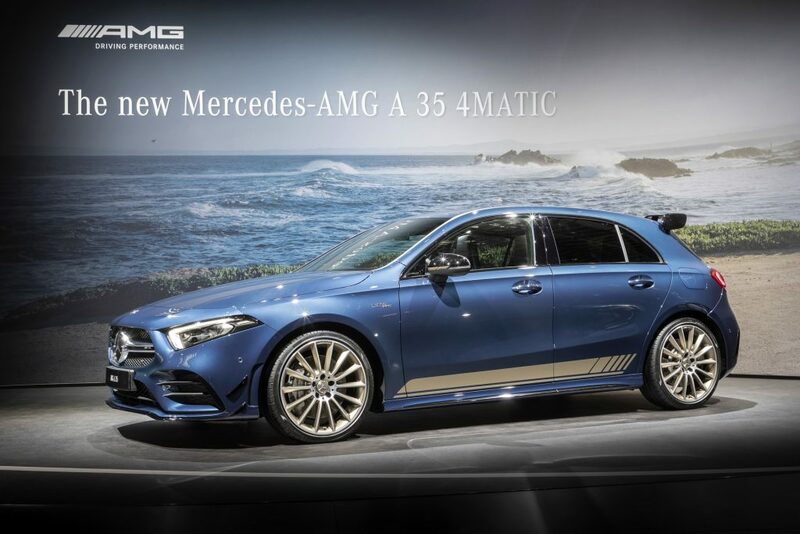 Mercedes has opened the order books for AMG’s new entry-level model, the A35 4Matic. 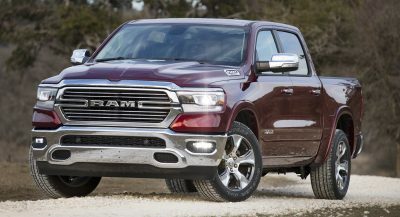 First deliveries are expected in spring 2019. 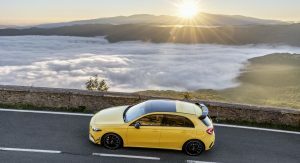 The new Audi S3 rival -and hottest version of the A-Class until the A45 shows up– features a turbocharged 2.0-liter four-cylinder engine with 301hp (306PS) and 295lb-ft (400Nm) of torque, paired to a seven-speed dual-clutch automatic transmission and all-wheel drive. 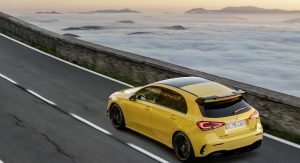 Straight-line performance is rather strong, with Mercedes-AMG claiming a 0-62mph (100km/h) in 4.7 seconds, while top speed is limited to 155mph (250km/h). 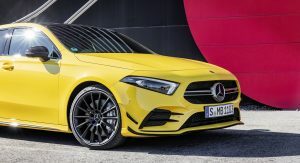 And since this is a proper AMG model, the chassis has been reinforced with additional bracing and an aluminum plate underneath the engine to make it stiffer up front. 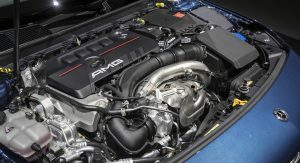 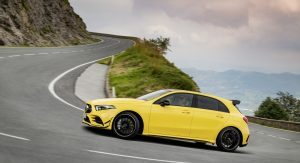 In addition, there’s an AMG-specific front steering knuckle and AMG’s Ride Control adaptive suspension, the latter being offered as an option. 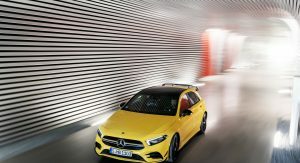 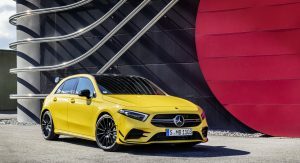 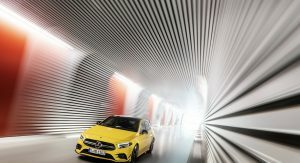 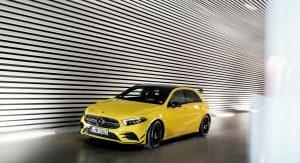 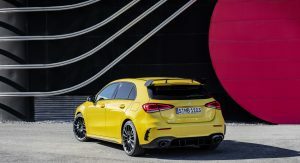 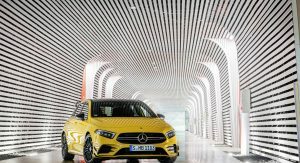 The all-wheel drive system is a revised version of the previous A45 AMG, offering a variable torque distribution between the axles between 100:0 and 50:50 front to rear. 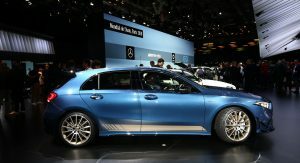 The engine features a model-specific twin-scroll turbocharger, retuned variable valve control and a unique active exhaust system, among other features. 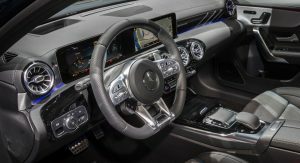 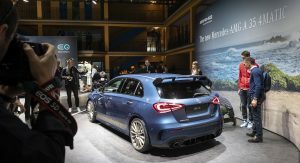 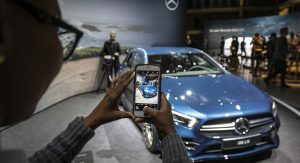 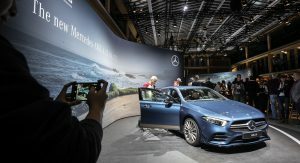 All Mercedes-AMG A35s will feature the latest MBUX infotainment system with ‘Hey Mercedes’ voice activation and dual seven-inch displays as standard. 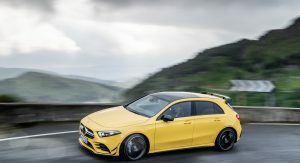 A set of 18-inch AMG alloy wheels, Nappa leather steering wheel, Dynamic Select with five driving modes, two-zone climate control and Keyless Go are also part of the standard equipment. 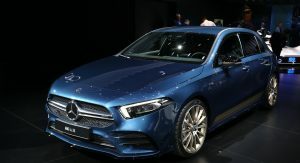 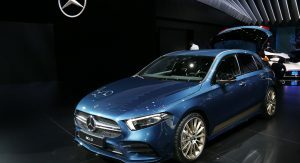 Mercedes will also offer the AMG Executive equipment line as a £1,395 option, which adds a bigger 10.25-inch infotainment display, heated front seats, parking assist, leather upholstery and electrically folding door mirrors. 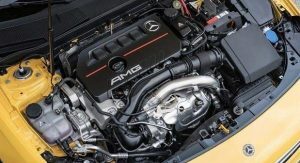 Building on the Executive line, the AMG Premium package costs £2,395 and adds a bigger 10.25-inch display for the driver’s gauges, ambient lighting, illuminated door sills, a better audio system and a rear armrest, among other. 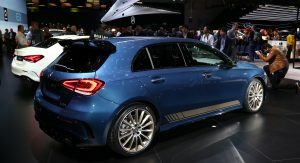 Finally, there’s the Premium Plus package, which for £3,895 and in conjunction with the Executive, Premium or Premium Plus packages adds a Burmester surround sound system, electrically adjusted front seats, Multibeam LED headlights and a panoramic sunroof. 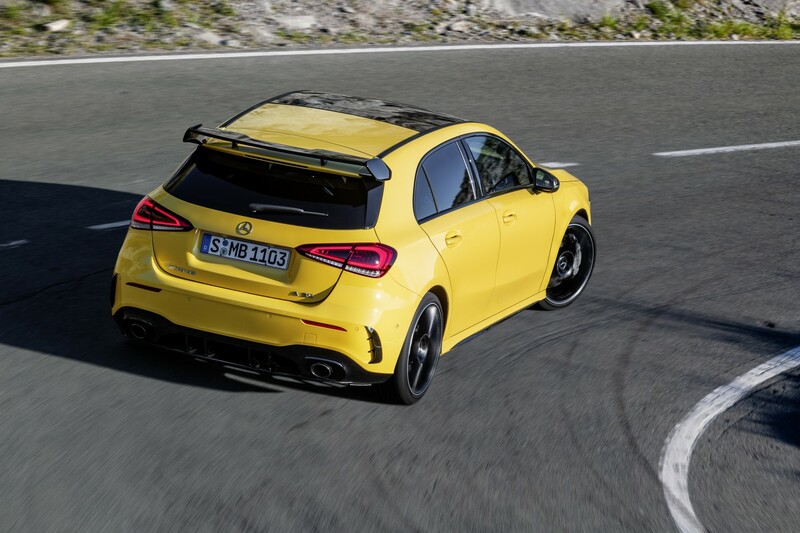 Pricing for the 2019 Mercedes-AMG A35 4Matic starts from £35,580 in the UK, making it just £670 more expensive than a VW Golf R fitted with a DSG tranmission. Like I just said in the Lexus LC article, yellow is putrid on most anything, save for school buses. 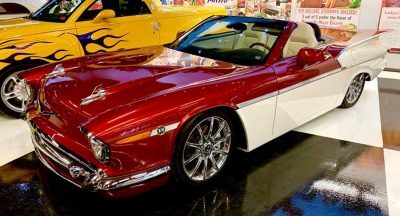 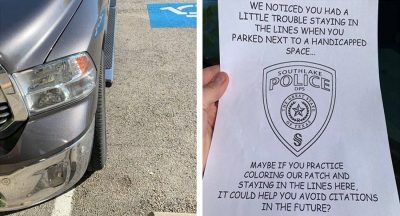 Gotta disagree, it suits this style of car. 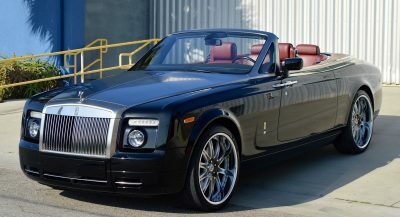 It looks tons more appealing than these new deep blue images with silver wheels. 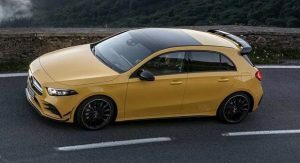 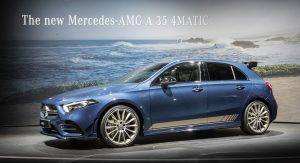 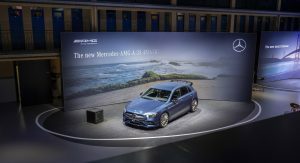 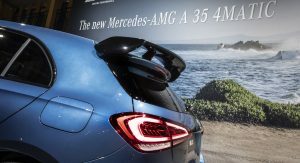 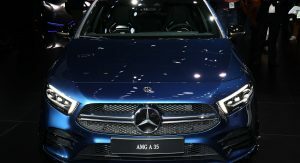 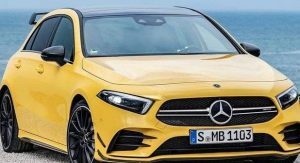 Is the US getting any version of the AMG A35? 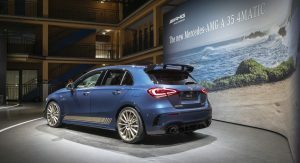 I like the blue one with the graphics on the side. 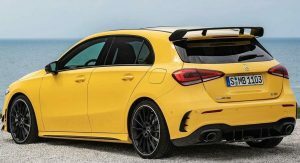 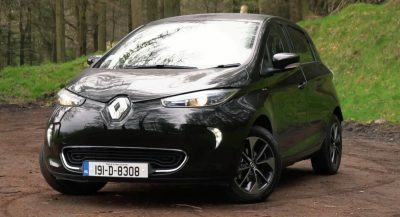 If this can come here at $35k I’d buy it in a heartbeat over a type R and most every other hot hatch as long as the performance matches the looks.